At SharkScope we currently track 1 million+ online poker tournaments per day and we have a 99% coverage rate for most networks. This unfortunately means that occasionally tournaments will be missed. 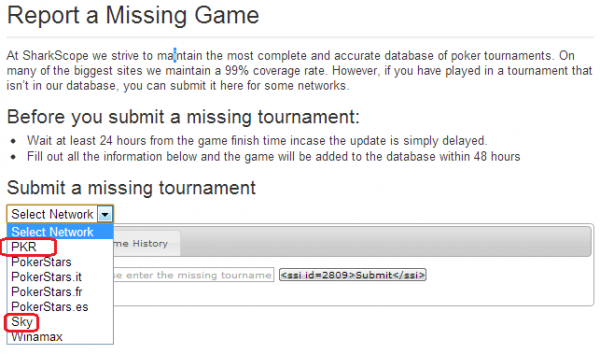 Once a tournament has been missed for some networks it can be recovered and added to our database by reporting a missing game on our Report Missing Games page. Previously we have only been able to support the retrieval of PokerStars and Winamax games, but we have been working hard to add more networks to this feature to ensure that you can have complete coverage of your tournaments. So we are pleased to announce we have now added Sky Poker and PKR to the list of support networks. We are working hard to add further networks to this function and hope to announce them shortly. We’ve now significantly increased the scope of our leaderboards to include a Count leaderboard for most games played in each category and Best 500 Streak Av Profit leaderboards for all leaderboards that previously just had the Best 100 Streak Av Profit type. 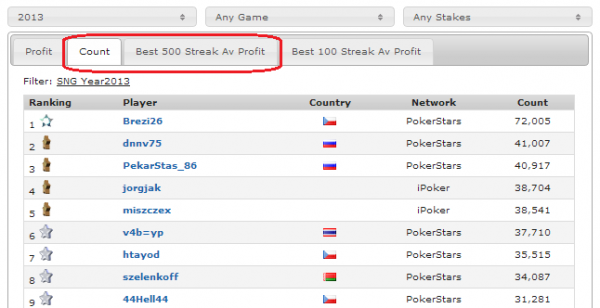 Adding a 500 streak leaderboard allows users to see what the greatest possible long term profits are for the very best players, whereas the 100 streak leaderboard shows the hottest shorter term runs. The Count leaderboard shows both how much volume the most active players are playing and also allows you to identify which networks that volume is actually possible on for that specific category, should you also be looking to play a large volume of that type of game.